Leading developer and asset manager, Canmoor, has completed the first phase of its multi- million refurbishment at Anchorage in Salford Quays. 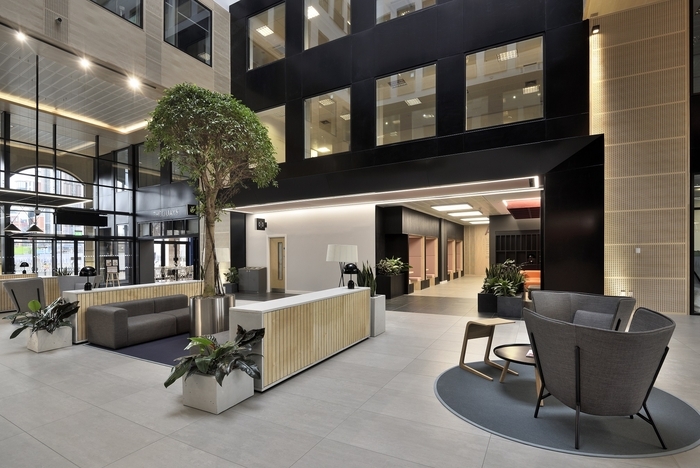 The entire ground floor and atrium of Anchorage 2, the largest and central focus of the four office buildings which make up the development, has undergone an extensive refurbishment, resulting in a tenant-friendly, contemporary concourse with collaborative workspace and dedicated facilities to boost tenant wellbeing. The reconfiguration of the ground floor has also made way for The Quays, a stylish new food and beverage outlet. There are also plans to extend The Quays’ offering in the summer with proposals being considered for an alcohol license available some evenings for tenants to enjoy a relaxing quay-side drink before heading home. Part of the extensive ground floor refurbishment has seen shower and changing facilities installed, as well as a flexible wellbeing studio which can be used for pop-up yoga classes or personal training sessions. As part of this first phase of renovation, the 8th and 9th floors of Anchorage 2 were also comprehensively refurbished and are now ready for occupation. The refurbishment programme continues throughout the Anchorage estate, with other vacant floors available for bespoke redesign for potential new tenants. Ian Murray, director at Canmoor, said: “The transformation of the ground floor of Anchorage 2 was an integral part of our refurbishment plans for the whole development. We envisage that this space will act as a social hub for tenants across the whole Anchorage estate, offering a base for informal meetings and social catch-ups, as well as a place they’re proud to welcome clients and guests to. Since The Quays opened, it has already created a new dynamic in the building, bringing vibrancy and activity to the heart of the scheme. JLL and Edwards & Co are joint letting agents on the scheme.